Mpule Keneilwe Kwelagobe (born November 14, 1979) is a Botswanan investor, businesswoman, model, beauty queen who was crowned Miss Universe 1999 and current President of Miss Universe Botswana Organization. She was the first black African woman to win an international beauty pageant title and the first debuting nation in nearly four decades. Kwelagobe has been recognized as a human health rights activist, especially for her fight against HIV/AIDS and advocacy for youth and women to have greater access to sexual reproductive education and services. She is the co-founder of QuesS Capital LLC, a private equity firm with investments in financial services, renewable energy and agriculture in Africa and South Asia. In August 1997, Kwelagobe became the youngest woman to be crowned Miss Botswana at the age of 17 years. She was a high school student at Lobatse Secondary School. Kwelagobe represented her country in the Miss World pageant in 1997 in Mahe, Seychelles but did not place. In February 1999, she won the inaugural Miss Universe Botswana, becoming the first woman to be crowned Miss Botswana twice. She was the first Miss Universe Botswana and the first Miss Botswana to participate in the Miss Universe pageant. Kwelagobe arrived in Port of Spain on May 5, 1999 for the Miss Universe 1999 pageant, which was held on May 26 in Chaguaramas Convention Center, Trinidad & Tobago. She beat 84 other delegates to win the Miss Universe pageant. Kwelagobe became the first Miss Universe to come from a debuting nation since 1958. She arrived in her new home of New York City two days after being crowned Miss Universe. For the duration of her reign she lived in Trump Place and worked in Trump Tower as Donald Trump was the owner of the Miss Universe pageant in partnership with CBS. Following her reign as Miss Universe, Kwelagobe became a spokesmodel for Clairol. The two page ads first appeared in magazines in the U.S. while Kwelagobe was Miss Universe. In 2002, she became the first Miss Universe to enter an Ivy League university following her reign. In 2000, Kwelagobe was appointed as a Goodwill Ambassador by the United Nations, focusing on youth and HIV/AIDS. Among others, she has addressed the World Summit on Sustainable Development, the Least Developed Countries conference, the World Youth Summit and the United States Congress (the United States House of Representatives Committee on Banking and Financial Services). Kwelagobe testified on the socioeconomic impact of AIDS in Africa and proposed a bill to set up a World Bank AIDS prevention trust fund. In 2001, Kwelagobe was honored with the Jonathan Mann Health Human Rights Award by the International Association of Physicians in AIDS Care (IAPAC). She was honored alongside the principal administrator of the European Commission HIV programme, Lieve Fransen. In 2003, she was selected as a Global Leader for Tomorrow (GLT) by the World Economic Forum, and in 2006, she was selected by the same organisation as a Young Global Leader (YGL). In 2015, Kwelagobe signed an open letter which the ONE Campaign had been collecting signatures for; the letter was addressed to Angela Merkel and Nkosazana Dlamini-Zuma, urging them to focus on women as they serve as the head of the G7 in Germany and the AU in South Africa respectively. ^ "HIV/AIDS Subject of Banking Committee Hearing - Women's Congressional Policy Institute". womenspolicy.org. Retrieved 12 November 2018. ^ "UNFPA Goodwill Ambassador Wins Jonathan Mann Award for AIDS Work". United Nations Population Fund. 19 November 2001. Retrieved 2 March 2018. 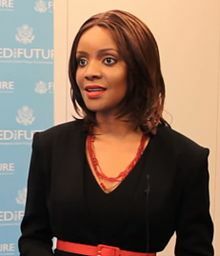 ^ "World Economic Forum Selects UNFPA Goodwill Ambassador as a Global Leader for Tomorrow". www.unfpa.org. Retrieved 12 November 2018. ^ "Ms Mpule Kwelagobe - AIMS". www.nexteinstein.org. Retrieved 12 November 2018. This page is based on the Wikipedia article Mpule Kwelagobe; it is used under the Creative Commons Attribution-ShareAlike 3.0 Unported License (CC-BY-SA). You may redistribute it, verbatim or modified, providing that you comply with the terms of the CC-BY-SA.